1. Preheat a fan forced oven to 220°C and line a large oven tray with baking paper. 2. 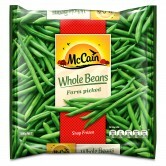 Cook McCain Whole Beans according to packet instructions and allow to air dry. 3. Place plain flour, garlic powder and onion powder in medium sized bowl, mix well and set aside, place whisked eggs in a medium sized bowl and set aside, place parmesan and panko crumbs in a medium sized bowl, mix well and set aside. 4. One at a time, coat McCain Whole Beans in the flour mixture and shake off excess, dip in egg, then in panko crumb mixture and turn to coat. Place on lined oven tray and repeat. 5. Place McCain Whole Beans in the oven and bake for 10-15 minutes, or until tender, golden and crispy. 6. Season with salt and pepper to taste and serve immediately. 1 Preheat a fan forced oven to 220°C and line a large oven tray with baking paper. 2 Cook McCain Whole Beans according to packet instructions and allow to air dry. 3 Place plain flour, garlic powder and onion powder in medium sized bowl, mix well and set aside, place whisked eggs in a medium sized bowl and set aside, place parmesan and panko crumbs in a medium sized bowl, mix well and set aside. 4 One at a time, coat McCain Whole Beans in the flour mixture and shake off excess, dip in egg, then in panko crumb mixture and turn to coat. Place on lined oven tray and repeat. 5 Place McCain Whole Beans in the oven and bake for 10-15 minutes, or until tender, golden and crispy. 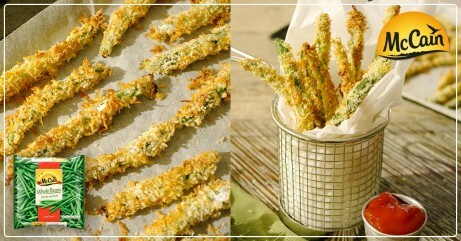 6 Season with salt and pepper to taste and serve immediately.